Stump left behind after an iconic Norway maple was destroyed in September. A second followed. Employing a tactic, late Friday press releases, favored by politicians as a way to diminish attention, RIOC said it planted "Two new swamp white oak trees" where a pair of revered Norway maples were destroyed without community consent in September. Without ever conceding that mistakes were made (See RIOC Scrambles to Justify Iconic Trees Destruction), both in the way decision-making was handled and the State's callous disregard for residents' values, RIOC planted the new trees, swamp white oaks, not sweet gums as suggested in a rush to coverup September's fiasco. In a gushy statement, RIOC's spokesman said, "Swamp white oaks can reach up to 80 feet in height and live up to 350 years. The trees were planted along the northern area of the lawn, which allows for better sight lines for pedestrians walking along the pathways and room for the trees’ crowns to grow unobstructed by the existing adjacent trees on the lawn." 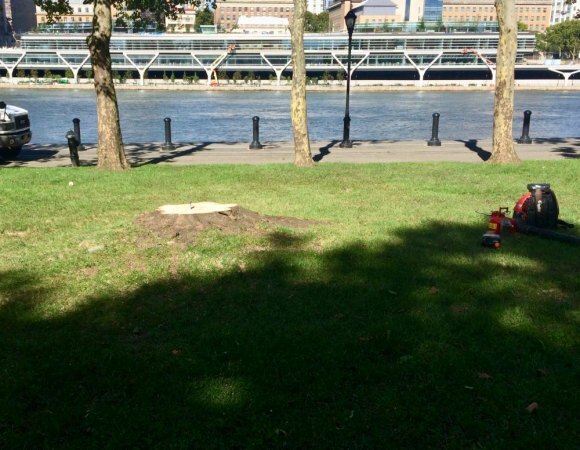 New tree planting, Rivercross lawn. But it will be decades before the oaks, if viable, add significantly to the character of a public space devastated by arbitrarily removing two Norway maples whose growth once built the central canopy over the lawn. RIOC repeated it disputed insistence that the maples were "...in declining health and presenting a safety hazard of falling branches and limbs." Only one favored contractor, out of three, called for removing both trees and was awarded a contract under questionable conditions, also never explained by RIOC. There is no indication in the statement that RIOC consulted with the Residents Association, which publicly condemned removing the iconic trees, nor that heed was paid to an observation from Wildlife Freedom Foundation Executive Director Rossana Ceruzzi that "... wildlife lived on and inside those trees." Public pressure forced RIOC to replace the destroyed maples but does not seem to have taught them anything about engaging with residents or building a community dialogue. 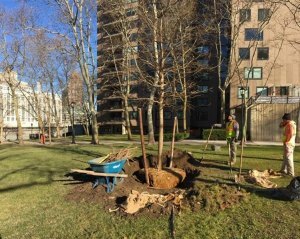 As an afterthought buried at the end of the late Friday release, RIOC claims, "Dr. Ali Schwaryi of the Roosevelt Island Tree Board was consulted on the tree selection and placement," but does not include any statement from Dr. Schwaryi or say anything about how extensive that engagement might have been or if they paid any attention. Glib and detached best characterizes RIOC's most recent action.